A common complaint from fans about the Combiner Wars Optimus Prime and Motormaster toys are that their hip ratchets make it very hard to stand the toys up when combined with the Combiner Wars Deluxes. It seems as though Hasbro has heard the complaints, and has retooled the hips on Combiner Wars Battle Core Optimus Prime to allow them to lock out in a more vertical position in robot mode – making it much easier to pose the combined form, Optimus Maximus. Reports state that Takara-Tomy followed suit and used these fixed ratchets for their release of Motormaster in the Unite Warriors line. Motormater is due to ship alongside Battle Core Optimus Prime – it remains to be seen if these Wave 4 repack Motormasters will also feature the new hip ratchets. A big thanks to TFW2005 member Payres for bringing this to our attention. Did you leave the rear end of Mirage flipped down? You have to transform that mold different ways to obtain different lengths. Isn't this 1/4 inch move that isn't in the instructions. Have you watched any video reviews of this mold? I think he means one hip has the old ratchet, one has the new ratchet. 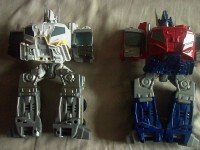 Correct, one leg has the new ratchet piece, the other leg has the old ratchet piece. Here is whats funny, I ordered a replacement figure from Amazon and it was the exact same way, same leg had the new ratchet and same leg had the old ratchet. I thought that maybe hasbro was doing this to kinda "meet in the middle". Basically they are thinking that the leg with the new ratchet will improve combined mode and the old ratchet will help with robot and transformation. But after taking the legs apart to swap the gear sets, I've came to the conclusion that they must have a bucket of the old gear sets and are splitting it up until they get rid of the excess stock. How do I know? The old ratchet design pieces on both of my units were a noticeably darker plastic color when compared to the new ratchet design. I forgot to mention, something else I noticed that I found odd is the springs used in the primes. One spring is your standard issue shiny stainless steel spring with slight bluing to increase tinsel strength. But then the spring in the other leg is this cheap dull weak light gray thing. I am not even sure if they are made out of the same metal mix. The difference is very noticeable and is consistent between both figures. Have we really came to the point that hasbro has to cut in questionable quality springs in toys to save money? You're prolly right but it was hard to tell, ergo the question. One has a ratchet and one doesn't? The fixed ones should have ratchets in both, just that they're re-oriented to not have the detents leaving the legs at wacky angles. My new one does at least. Oh, and no such luck in getting fixed shoulders. Oh well, maybe some Future will fix this. I just noticed something off… I got a battlecore OP today from amazon. If your Motormaster has an embossed code on back of the box starting in a 5 then it's the fixed version. It's currently in Grand Scourge (a redeco of CW Optimus Prime), the wave 4 version of Motormaster, Unite Warriors Motormaster, and Battle Core Optimus Prime. It is unknown if the upcoming Unite Warriors Optimus Prime combiner has those fixes. 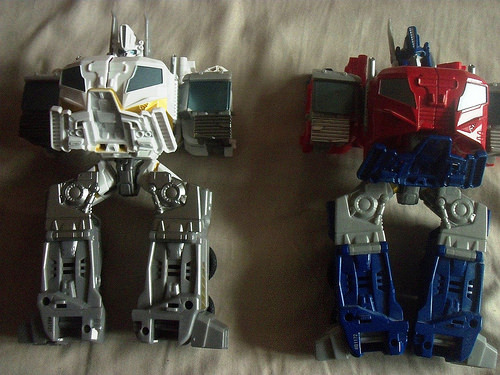 But, no, a fixed hips version of the original Optimus Prime doesn't exist. I think we believe Scourge is fixed from the publicity photos but nobody with one in hand has confirmed it yet with photo evidence of the combined form. I don't have the patience to go through all these "hips fixed" threads….so I'll just ask. 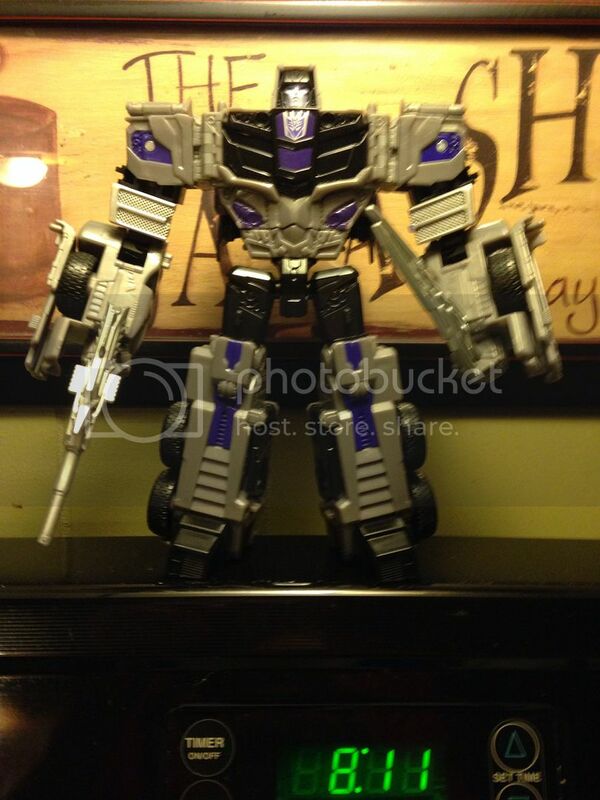 If I pick up a CW Optimus "today" ….will these hips be fixed? Or does all this only pertain to MM and the White Prime? Wonder if the new wave of HASBRO Motormasters has also this improvement. Is it safe to assume that none of this news matters if you have the Perfect Effect Hip upgrade installed? okay so I just got the mm from amazon. it has the hip fix, but the shoulders aren't really fixed. they stick a little better, but they are just holding in place. the chest minion doesn't stick any better anyway. so really, just get the new one if you want the hip fix. Where the shoulders in torso mode fixed? convert to torso, but when locking in the shoulders take the hook part of the axe and jam it into the wind vain, adjusting the grip height between the hands and the wind vain. The "sharp" end of the axe should be nudged between the wind vain and the shoulders. Repeat for other arm (with First Aid/Ironhide axe) and Menasor should be as tight as Superion . I just ordered mm from amazon. I will let you guys know about torso mode shoulders and chest minion connection.